Presenting a very few only of the Legendary and Miraculously Powerful Magic Shield of Reflection – The Takrut Maha Ga Saton Glab of Kroo Ba Noi Dechabunyo (Wat Sri Don Moon). The Takrut Maha Ga Saton Glab, is a ‘Serp Dtamnan’ amulet, continuing on from his Kroo Ba Ajarn and Mentor, the Great Kroo Ba Pad, previous Abbot of Wat Sri Don Moon. The words ‘Serp Dtamnan’, mean ‘To Preserve And Continue The Legend’, which is precisely what Kroo Ba Noi has intended. The Takrut is small in size and contained within a decorative tubular casing for wear as a pendant. Its small size allows for ease of portability and can be worn by men or ladies easily. 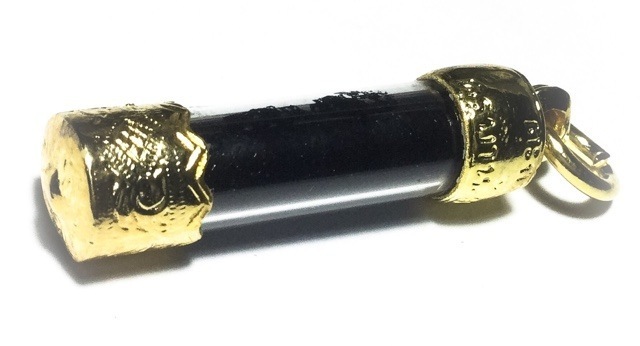 The Takrut Ga Saton Glab is legendary for its power to reflect danger and dark influences, as well as assist in improving Karma and Prosperity. The words ‘Saton Glab’ mean ‘To reflect and send back’. Any ill wishers who try to harm the wearer will find the energy is reflected back to its sender, sending it back from whence it came. The Takrut Maha Ga Saton Glab,is perhaps the most famous of all amulets of Kroo Ba pad, and Kroo Ba Noi too. The Takrut Maha Ga Saton Glab of both Kroo Ba Pad and Kroo Ba Noi, are now extremely rare to find, and highly sought-after amulets by those in the know. Kroo Ba Pad was the Kroo Ba Ajarn of Kroo Ba Noi, bestowing all of his powerful Lanna Style Wicha upon him over the years that Kroo Ba Noi served under him. The Takrut Maha Ga Saton Glab of Kroo Ba Noi is now very famous after two households suffered explosions from faulty fireworks made for a large show, destroying the houses, without any of the family members being harmed. Various other miracles have been reported in the news connected with the Takrut Maha Ga Saton Glab, including the story of a civil servant in Prae Province who was shot at 5 times at point blank range with a shotgun, and the pellets only grazed past the top of his head. Kroo Ba Pad, is one of the nine top monks of Thai Lanna History, extremely famed for his diligent works in developing the ancient 500 year old temple of Wat Sri Don Moon, creating facilities for the Samanera and Bhikkhus of the region, and improving the quality of life for the local folk. His Takrut amulets are what he became most famous for, especially his Takrut Maha Ga Saton Glab, which carry legendary status, and are extremely rare amulets to find anywhere at all. Kroo Ba Pad was the Kroo Ba Ajarn to the Great Kroo Ba Noi, current abbot of Wat Sri Don Moon, who inherited the Wicha of Kroo Ba Pad, and who was the monk who was able to beseech Luang Phu Kroo Ba Pad’s corpse to allow itself to be cremated. You can see Kroo Ba Noi talk about his Kroo Ba Ajarn Kroo Ba Pad in the below video documentary (Thai with English Subtitles), and witness the miraculous events at the funeral of Kroo Ba Phad. 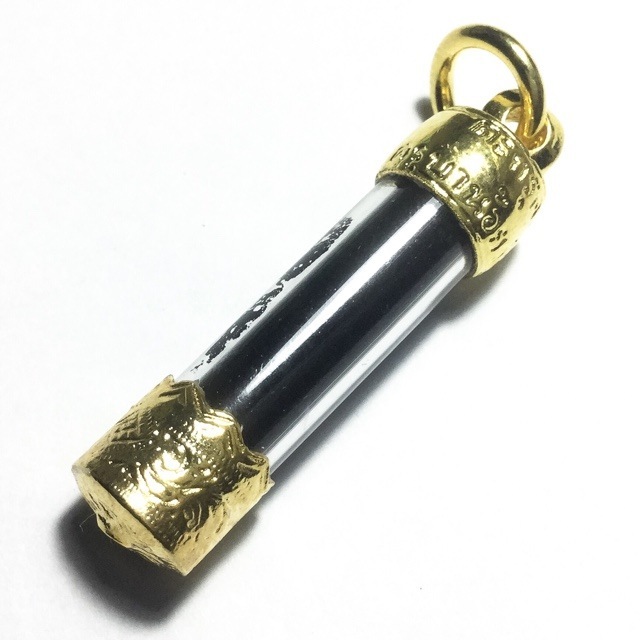 Kroo Ba Noi is a Master Gaeji Ajarn Guru Monk in his own right since many years, whose amulets and Patipata (diligence and purity of practice), has become so popular as to be easily regarded as the equal of that of his Kroo Ba Ajarn. Kroo Ba Noi is one of the Great Living Lanna Master Monks of the present Era, with an impeccable trajectory that is worthy and respectable for the continuance of the lineage of Kroo Ba Pad, and the temple of Wat Sri Don Moon. With Kroo Ba Noi, the Secrets and Power of the Wicha Takrut Ga Saton Glab are safely preserved and maintained alive and well in the present Era. The Takrut Saton Glab was empowered in Buddha Abhiseka Ceremony in the ‘Jaroen Sap’ Edition in 2554 BE, at Wat Sri Don Moon, in Sarapee, Chiang Mai). The Takrut Maha Ga Saton Glab is coated in Muan Sarn Sacred Powders composed of Sacred Relic substances (Pratat Ngern), hairs of Kroo Ba Noi from his Ceremonial head Shaving, and Pong Wan 108 (one hundred and eight Sacred Herbal Powders and Pollens). The Takrut is an excellent protector whilst traveling, providing Klaew Klaad, Kong Grapan Chadtri, and Gae Aathan with Saton Glab Magic to reflect any incoming bad luck or black magick attacks, and to evade all dangers, enemies and deadly disasters with pre-emptive magick.